Schedules should not be published until they are as complete as possible. After publishing, every time you make a schedule change, automatic notifications go out to affected the employees. If you have a lot of changes to make to an already Published schedule, you may want to retract (Unpublish) the schedule. Unpublishing normally sends out a message to all employees who already received the schedule telling them that the schedule is retracted and that a new one will be published at a later time. Employees who did not receive an email or who did not sign in to see the schedule will not be aware that it was ever published. 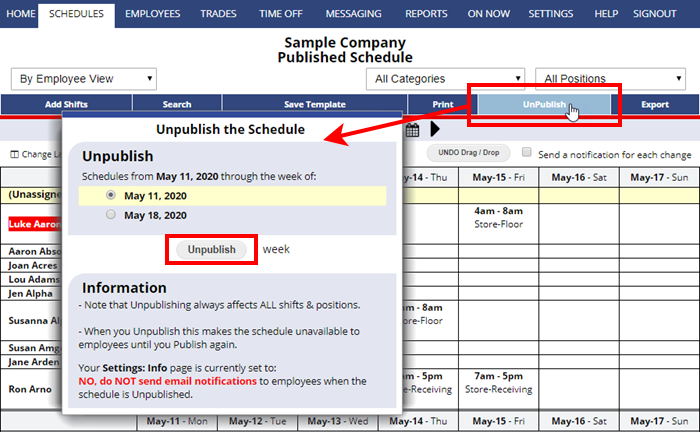 Unpublishing makes that week’s schedule and Tradeboard unavailable to employees online and sets your schedule page back to Unpublished – allowing you to use all the functions available for weekly Unpublished schedules (AutoFill, Import & Clear/Delete) and stops notices from going out when you make changes until you publish again. IMPORTANT NOTE: If a published schedule has shifts on the Tradeboard or in process and you Unpublish the week and reassign one of those shifts, it will remain on the Tradeboard or in process and look like the new employee wants to trade. This can result in confusion. Be sure to check the Tradeboard before Unpublishing a schedule to be sure that you are not reassigning any shifts already on the Tradeboard or in the process between employees trading. When you have finished making your changes and you are ready to Publish the schedule again, you can click Publish.